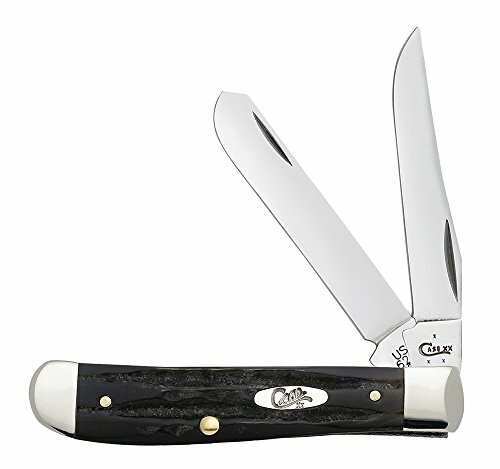 This Case Mini Trapper pocket knife is part of the Buffalo Horn family. The water buffalo has been one of mankind’s most useful resources for thousands of years, and the properties of the genuine Buffalo Horn make it a natural handle material choice for this knife. Mini Trappers are a smaller version of our Trapper. This durable folding knife features a smooth fiberglass and epoxy composite black handle with two full length blades, the Clip blade and the Spey blade. The Clip blade is commonly used as a multi-purpose blade and preferred for detail work. The Spey blade is commonly used as an all-purpose utility blade. The basic trapping and skinning blades make this a must-have knife for those who trap small game. This knife is constructed with Case Tru-Sharp Stainless Steel which is a special high-carbon steel that helps the blades hold an edge longer than conventional steel. It also offers extraordinary blade strength and corrosion resistance. This pocket knife is suitable for everyday demands, the outdoors, or hiking. Comes conveniently packaged in a box. Made in Bradford, PA, USA from domestic and imported materials. The Case Pink Camo Mini Blackhorn is a part of the Pink Camo Case Caliber Family. Beauty and brawn unite with these pink camouflage-styled knives with lightweight zytel handles. Virtually unbreakable and wear resistant, the easy-grip handle is a must have. Constructed with a locking blade, this knife is a blend of a fixed blade knife and a traditional pocket folder. 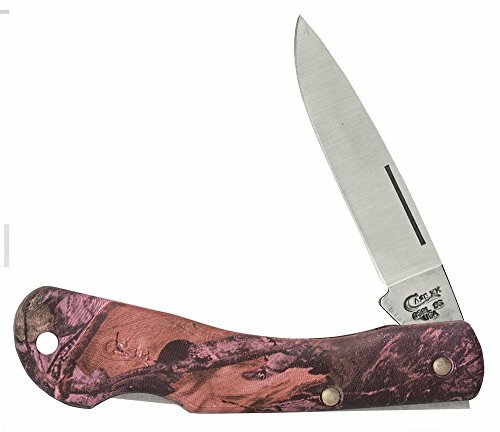 This pocket knife features a locking as-ground Drop point blade and a pink camo lightweight handle for a secure grip. The Drop point blade is ideal for gutting larger game animals. This blade is constructed with Case Tru-Sharp Stainless Steel which is a special high-carbon steel that helps the blades hold an edge longer than conventional steel. It also offers extraordinary blade strength and corrosion resistance. The durable folding knife is great for everyday carry for projects around the house, the outdoors, and even engraving. 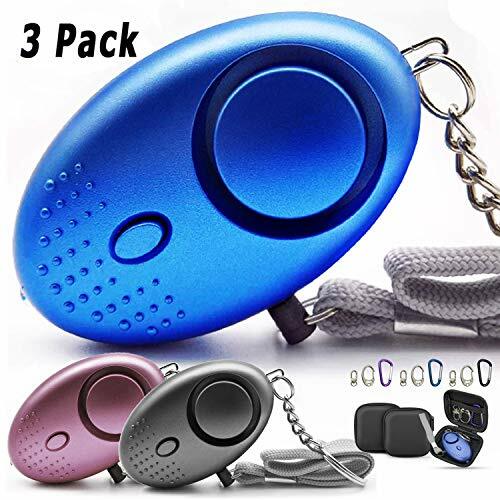 The slim design is perfect for a pocket or purse. Comes conveniently packaged in a box. Made in Bradford, PA, USA from domestic and imported materials. Case 65022 Jigged Buffalo Horn - Mini Copper Lock (BH1749L SS) Collectibles Knives & Blades Folding Blade. 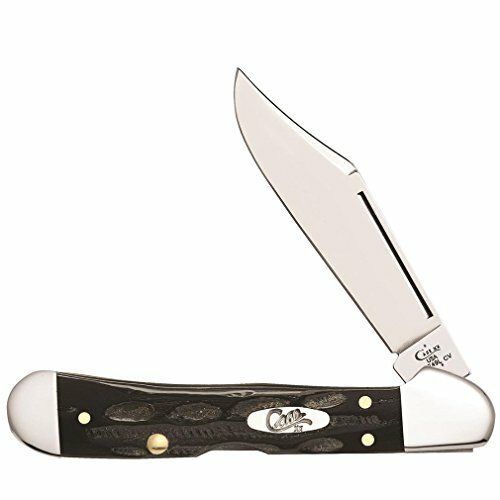 This Case Sod Buster JR knife is part of the Buffalo Horn family. The water buffalo has been one of mankind’s most useful resources for thousands of years, and the properties of genuine Buffalo Horn make it a natural handle material choice for knives. The Sod Buster JR is smaller than the traditional Sod Buster without compromising durability. The Skinner blade is ideal for skinning purposes among other different everyday demands. This knife is constructed with our Case Tru-Sharp Stainless Steel which is a special high-carbon steel that helps the blades hold an edge longer than conventional steel. It also offers extraordinary blade strength and corrosion resistance. This pocket knife is suitable for everyday demands, the outdoors, or hunting. Comes conveniently packaged in a box. Made in Bradford, PA, USA from domestic and imported materials. 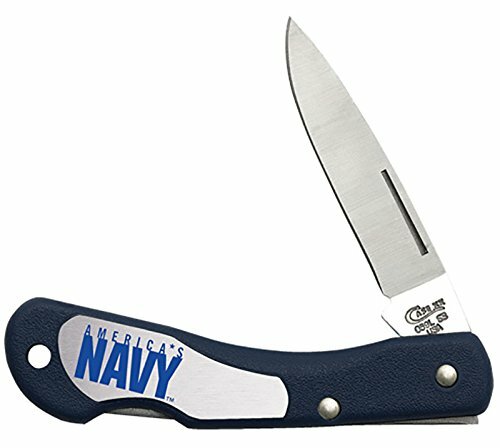 Case U. S. Navy 17711 Mini Blackthorn lt1059l SS. 3 1/8inch closed length, true sharp surgical steel blade honed by hand to a razor sharp edge. 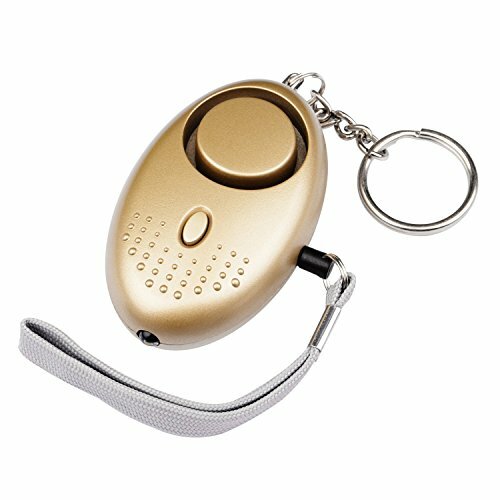 Safe lock back mechanism prevents unwanted closing of the blade. 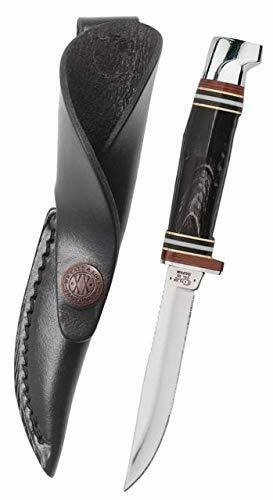 Case 17916 Buffalo Horn Hunter (BHMFINN SS) w/Leather Sheath Fixed Blade Knives Versatile top of the line Another quality product Fixed Blade Knives. 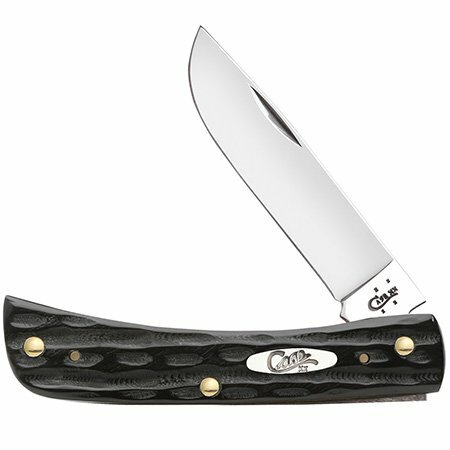 The Medium Buffalo Horn Hunter is a part of Case's Buffalo Horn Hunters family. This collection offers a natural handle material choice for our fixed blade hunters. Each is hand assembled from blade to end cap, then finished to perfection to preform just right for you. This fixed knife features a stainless sabre concave ground clip blade. This knife has a jigged buffalo horn handle along with an aluminum guard and end cap for a secure grip. The clip blade is commonly used as a multi-purpose blade and preferred for detail work. The Medium Buffalo Horn Hunter is ideal for trout, rabbit, and other small game. This durable fixed blade knife is constructed with Case Tru-Sharp Stainless Steel which is a special high-carbon steel that helps the blades hold an edge longer than conventional steel. It also offers extraordinary blade strength and corrosion resistance. Comes with a genuine black leather sheath. This fixed blade knife is perfect for the outdoors, hunting, or hiking. Comes conveniently packaged in a box. Made in Bradford, PA, USA from domestic and imported materials. Case Mini Blackhorn 3-1/8 In. 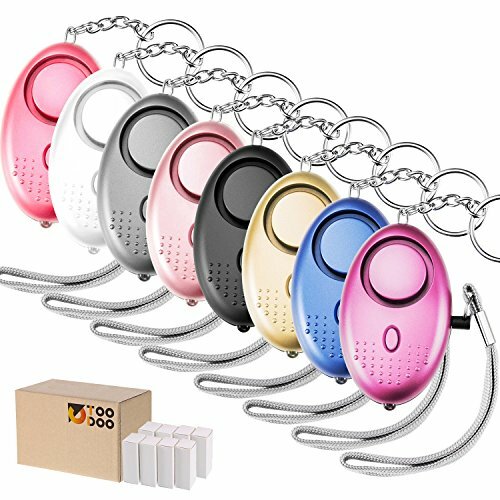 Tips to find the best prices on Case Mini Black Horn. Always take into consideration specials, rebates or other savings, including shipping, handling and taxes. aDealaLot Search Engine will always search for these offers, including the total cost, and provide you with the best price. New products, merchants and services are always being added to help you save time and money. Compare prices, read reviews on products and merchants and find specials not offered anywhere else.